Challenge: The Pew Center needed a carbon calculator that could encourage community participation and be customized for different brand partners. Results: Sunnywood collaborated with the team members assembled by the Pew Center to design and program the "Make an Impact" online calculator. Beyond the basic features, the requirements included user accounts to be able to save progress and results, as well as a recommendation system to tailor carbon-reduction strategies for each individual. The design can accommodate people wanting to do a quick calculation and those willing to dig deeper for more accurate results and more specific recommendations. 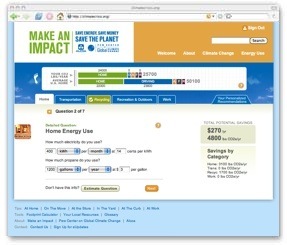 Built on the Drupal CMS, the Make and Impact calculator is easily branded and deployed for multiple Pew Center clients, including Alcoa, Bank of America, Entergy, and their own Pew Center version.